The other day, we had one of those rare days in WA when it rains all day. A couple of years ago, I wrote a post called ‘One Perfect Day’. It was one of those days. I just love rainy days. You can’t go outside and work. All you can do is stay inside and play. Yippee! Well … I guess you could do housework but that would be silly. Because we had all day, I thought we would make something a bit different for dinner. If we are busy outside, we usually have what we can whip up in the shortest time. I had taken a chicken out of the freezer the day before so it would be “chicken and something”. I went to Eat Your Books and typed in “chicken and rose water” – (I was thinking something Middle Eastern). I didn’t get any hits so I tried again. This time, I typed in “chicken and cinnamon”. I don’t know why I chose cinnamon to go with our chicken but it worked. This recipe was one of the hits. It is from NZ Cuisine Magazine Issue 130, September 2008. The recipe is by Lauraine Jacobs. I chose this recipe from my selection because: we had all the ingredients; the picture in the magazine looked lovely and colourful; and it seemed right to be cooking with citrus when we have six trees laden with fruit. Bloggers everywhere are posting citrus recipes at the moment and why not? It is citrus season. Even if you don’t have a tree, you probably know someone who does. If not, don’t despair, because citrus should be cheap in the supermarkets. Dinner was very pleasant. Maus loved it. As she finished her meal, she declared, ‘That is definitely dinner party material.’ High praise indeed from the fussy one. I won’t say this is a dish you can whip up in 5 minutes. You have to brown the chicken which is always a pain. But once that is done, it is all clear sailing. If you are preparing this dish for guests, you can prepare it in the morning up to point 9. Just before your guests arrive, add the browned chicken to the pot and put it into the oven. As the chicken will be cold, it may take a little longer than the 40-50 minutes. Small price for a perfect, carefree, dinner party meal. Mine took much longer than the 40-50 minutes because I cooked it in the Thermalux Gourmet Cooker. I don’t recommend them. The oven does not get hot enough for cooking much more than a casserole. I was surprised, when I took it out of the oven, that the chicken was cooked perfectly. segments of 1 orange, to serve. Preheat the oven to 190°C or pack your fire with wood. Cut your chicken into 10 pieces – drumsticks, thighs, wings and cut the breast in half. Pat the chicken pieces dry. In a shallow bowl, mix the flour, cumin, cinnamon, turmeric, salt and pepper together. Dip the chicken pieces into the flour mixture to coat well all over. Shake off the excess flour. Heat some oil in a frying pan. Fry the chicken pieces until golden brown all over. Remove to an oven-proof dish that is big enough to take your chicken pieces in one layer. Turn the heat down and add the onion to the frying pan. Cook the onion until soft and transparent. If the pan gets too dry, add a little oil or water. Add the red capsicum strips and cook until they soften. Bring the sauce to a simmer then pour it over the chicken pieces. Cover with tin foil then place in the oven. Bake for 40-50 minutes or until the chicken is cooked to your liking. Remove from the oven and taste for salt. I needed to add some because I used home-made stock which has no added salt. If using commercial stock, you may not need to add any salt. Scatter with chopped parsley and orange segments. We had potato, broccoli and carrots with our chicken. 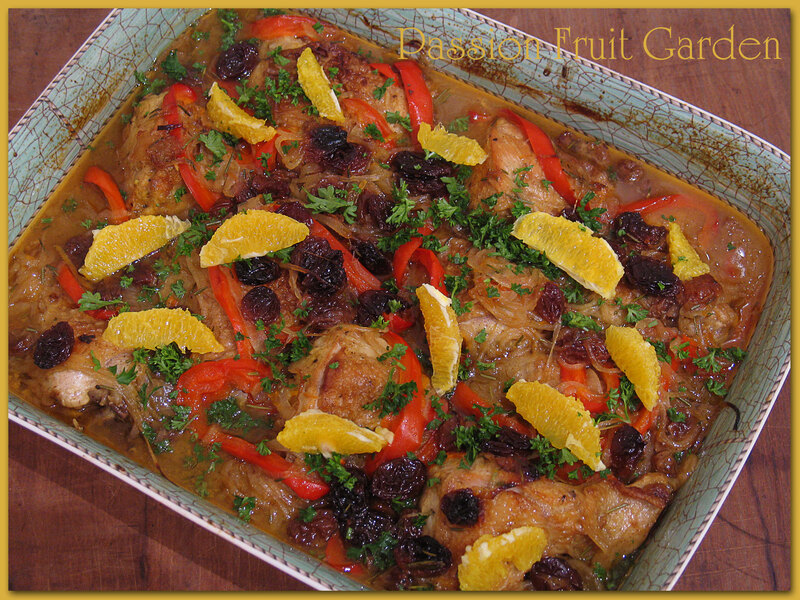 This entry was posted in Chicken & Duck, Eating your bounty, Oranges, What's for dinner? by Glenda. Bookmark the permalink. Hi Merle, I am guessing it is Leila Fiddian. Yes, she worked with Maus many years ago. Absolutely Ella, though you will be experiencing Broome winters at the moment which would be very different. Broome winter… happy sigh 🌞 but we’re headex south, and currently cool in Carnarvon 🌧 but is forecast to be nicer tomordow onwards. It sure is John, and fab that all the work has already been done. A windy, rainy, cool day, particularly at the weekend, is my idea of absolute bliss. I would do exactly what you did and head for the kitchen. In Brisbane those days are pretty rare and I don’t have a wood fire – only a DVD of a crackling log fire which I deploy on such days:) There is something so cocooning about those sorts of days; my home feels warm, safe and secure and a delicious meal is the extra log on that cosy fire – aren’t we lucky, Glenda. Hi Jan, so lucky I can hardly believe it. We don’t have many days where it rains all day. Most days, we spend our time trying to do things between showers. That is why the all day affairs are so wonderful. It is not even worth the effort putting the gardening gear on. Love those rainy days, Liz. Always up for a good chicken dish. This one sounds Moroccan inspired – except perhaps for the rosemary. Will need to try. Debi, funny enough, I found a recipe today with ‘Middle East’ in the title that used rosemary.